More people from the Horn of Africa region, especially Ethiopia and Somalia, are crossing international borders as irregular migrants - lacking official documentation or approval - drawn by the promise of a better life in the Arabian Peninsula. “A growing number of Ethiopians opt to undergo a perilous journey through the Gulf of Aden, hoping to get to the Middle East via Yemen,” Demissew Bizuwerk, a communication officer for the International Organization for Migration (IOM) in Ethiopia, told IRIN. “A significant proportion of these migrants travel with little or no information about what they would be encountering, and they are, in one way or the other, misled, mistreated and often abused,” he said. Between 1 January and 30 November 2012, a total of 99, 620 migrants arrived in Yemen, according to the UN Refugee Agency (UNHCR). By comparison, 103,154 people arrived in 2011, 53,382 in 2010, and 77,802 in 2009. Of the 2012 arrivals, 78 percent were Ethiopian and just under 22 percent were Somali. “Most Ethiopians enter Yemen illegally as irregular maritime migrants, on boats from Djibouti and Puntland, Somalia,” said an October report by the Danish Refugee Council (DRC) and the Regional Mixed Migration Secretariat (RMMS) titled ‘Desperate Choices: conditions, risks and protection failures affecting Ethiopian migrants in Yemen’. The Obock area in northern Djibouti is a popular transit point for irregular migrants heading to Yemen, who travel there from points on the Ethiopian and Somali borders. "Some people don’t know that there is a sea between Djibouti and Yemen, that it is deep, that the boats they may travel on are not the best and that they are overcrowded"
When possible, IOM tries to sensitize irregular migrants about the risks they face. “Initially, when some people travel, they don’t know what to expect; when they face desert conditions here [in Djibouti], they realize it can be hard,” said Doumbia. Regular migration may include official permission and documentation and take the form of a streamlined visa application process. The scarcity of economic opportunities is a major factor fuelling migration from Ethiopia, according to the DRC/RMMS report. Economic migrants from Ethiopia often head to Saudi Arabia and beyond, some regularly, some irregularly. “Distinguishing between regular and irregular migrants is not very informative as the lines between the two are blurred. A better distinction is between migrants with the resources and connections to exploit the opportunities offered by corruption, as well as the possibility of moving between regularity and irregularity, and those migrants who, due to their social and economic vulnerability, are simply exploited by these same forces,” the report says. The largest and most vulnerable group of Ethiopian migrants are those with no resources, who travel to Yemen by sea and enter the country illegally. Arrival in Yemen, which is facing a humanitarian crisis, presents a slew of problems. The migrants are often smuggled, trafficked or subjected to mental and physical torture throughout their hazardous journey, which increases their vulnerability, says Erich Ogoso, public information and advocacy officer at the UN Office for the Coordination of Humanitarian Affairs (OCHA) in Sana'a, Yemen. “By the time they reach Yemen, they are in need of humanitarian assistance. Most are economic migrants who end up placing a huge burden upon their host communities,” Ogoso said. The majority of the migrants live in cities, especially Aden and the capital Sana'a, stretching the limited facilities and services available. Others try to continue to Saudi Arabia in search of better opportunities, but many end up stranded and destitute, he said. In a briefing note on 11 December, Nicoletta Giordano, IOM’s chief of mission in Yemen, highlighted the plight of vulnerable migrants in and around the northwestern town of Haradh. “They include increasing numbers of single women, unaccompanied minors and elderly and sick migrants who are desperate for a way out of what has become a horrendous situation on the Yemeni side of the Saudi Arabian border,” the note says. IOM medical staff in Haradh reported widespread health problems among migrants due to insufficient food, poor sanitation and lack of shelter. Casualties from gunshots and landmines are also rising, they indicated. Haradh‘s morgue had exceeded its capacity with bodies of migrants. The DRC/RMMS report noted that “many Ethiopian migrants [in Yemen] face severe human right abuses that have not been systematically investigated,” adding that “kidnap, torture, sexual violence, abduction and extortion are becoming widespread and frequent hazards, sometimes lethal, for migrants in transit to the Gulf States”. Other risks include criminal gangs who capture, torture and extort migrants; sexual abuse; trafficking; forced labour; destitution; and discrimination. In Ethiopia, IOM is working with the government at the federal, regional and local levels to create awareness and support livelihoods for those prone to irregular migration. IOM is also supporting capacity building for relevant government bodies. In close collaboration with regional authorities, rapid market assessments are carried out to determine locally viable income-generating activities, such as raising goats, sheep or poultry or farming vegetables. IOM is also facilitating training workshops for police officers, public prosecutors, judges and officials in the Ministry of Labour and Social Affairs, and is supporting local-level migration task forces to prevent irregular migration, human trafficking and smuggling. 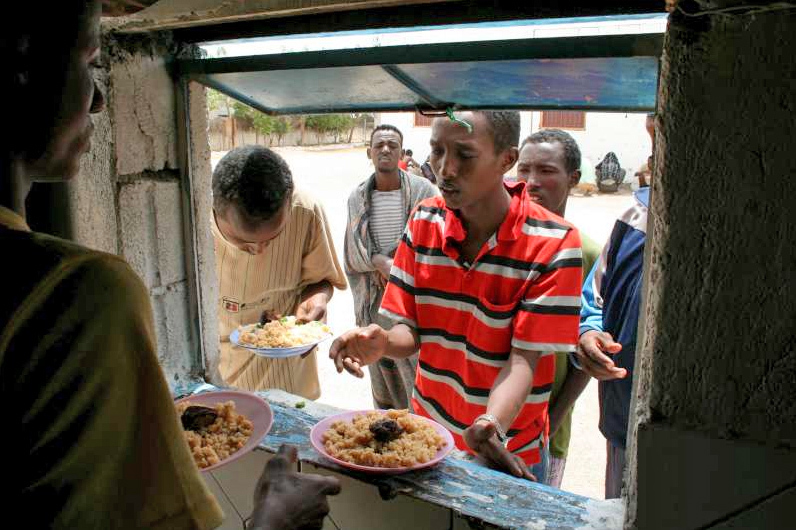 Since 2010, IOM has helped at least 9,500 destitute Ethiopian migrants leave Yemen. Hundreds of people have lost their lives crossing the Gulf of Aden; on 18 December, up to 55 people died when a boat carrying migrants capsized off the coast of Somalia.